Once you’ve shredded the pavement, it only stands to reason that you’ll want to shred just about every other sort of terrain as well. Alas, that’s often not possible — at least not with today’s skateboards and eboards. But here to right that wrong is Flux Design Co., with its newly launched Track 1. Heralded as the first eboard with an all-season track, this particular board is meant for outdoor enthusiasts with not only a need for speed, but a need for variety. The Track 1 is said to be able to ride on the streets, in the sand, snow, and dirt. Whether you’re simply looking for a board for your commute or a board to help you explore the great outdoors, Track 1 wants to go along for the ride (or rather, be your ride). 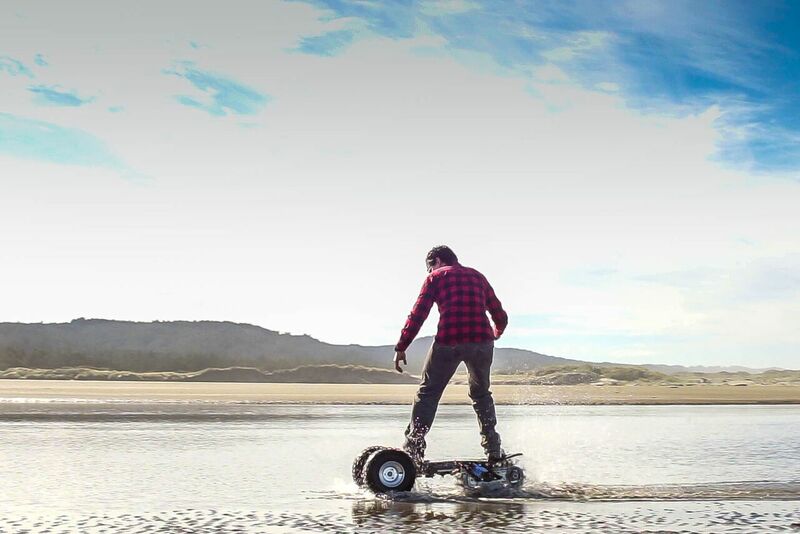 Promising to easily transition between a hands-free electric board to a utility vehicle, the Track 1 hopes to satisfy both adrenaline junkies and those who simply need a more efficient way to get around in rough terrain. Differentiated by its lightweight and durable track, the Track 1 boasts a utility handlebar, carbon fiber deck, foot bindings, patented flux track, and two ATV-grade wheels, all of which promise to equip riders with both the maneuverability and the flexibility they need for a decent riding experience. The track claims to have the traction equivalent to a 30-inch wheel, but without any of the added bulk or weight. Flux Design attributes the portability of the Track 1 to its proprietary mixture of polymers and aerospace composites. Capable of reaching speeds over 20 miles per hour, the Track 1’s battery is capable of supporting around 12 miles of travel. The interchangeable battery can quickly be swapped out with an additional battery for folks looking to go just a bit farther. And thanks to LED lights for night riding and its water resistant design, you can take the Track 1 just about anywhere at any time. Track 1 can now be pre-ordered from Indiegogo for the rather hefty price of $2,800. The boards are slated to ship in November 2018.